Friendships end for all kinds of reasons. And for no reason at all. There’s not always a good summary end to things. It can be painful. Sometimes, it’s a relief. Our friendships are so multifaceted, and they bring up such conflicts in emotion — they’re not blood-relations, and so there are completely different spheres of influence governing how we interact with those people who we choose to keep close to us. Inevitably, though, there will be those we choose to let go of from our lives. Sometimes, we feel overly responsible for the bad things others do, and we take a lot of time to recognise that we don’t have to carry that burden. Sometimes it’s more simple: you don’t share the same interests any more, your values no longer align, they’re actually more of a ‘frenemy’ than a friend (and you’re tired of the competition), you only hang out because of habit or tradition rather than really wanting to, your lives have changed a lot, or something bad has happened between you. All legitimate reasons for waving goodbye to a friendship. How Do Friendships End Badly? Also known as the Blow Up. Maybe you’re the types who don’t always see eye to eye anyway, but chances are more likely that there’s been a slow, steady build up of resentment over time — unspoken, not dealt with, which one day boils over completely. The Time Bomb is ticking, and one day you reach that point where you just can’t continue as you were. No more gritting your teeth, or smiling through it. Once you say certain things that can’t be unsaid, it can be tricky to get past. Forgiveness isn’t always possible, making this is a pretty dramatic way to end a friendship. We all know how prevalent the c-word is in relationships: communication is king when it comes to avoiding a relationship ending due to misunderstandings. And they happen quite easily, particularly when we’re dealing with other flawed human beings, like ourselves. Unchecked, misunderstandings can grow into full on resentment. You might assume what the other person is thinking, you might feel you can predict what will come next in your relationship, and without any clarity, your emotions might grow into something you feel you can’t get over. A small word or action might signal the end. So many relationships end merely because, with time, contact fades out and soon enough, years have passed and you’ve simply stopped being in touch with someone. Sometimes it’s a matter of merely being bad at keeping up the friendship work, other times it is deliberate. Then there’s the Cold Turkey — the sudden slap in the face end to all communication and contact. Sometimes this is ‘ghosting’. The Rage Quit might be another version of this, and I use these words deliberately for the classic ‘block and delete’ that people do on social media. Rage quitting a friendship sometimes means you never have a chance to actually discuss or figure out what went wrong, and that is often hard on both parties. 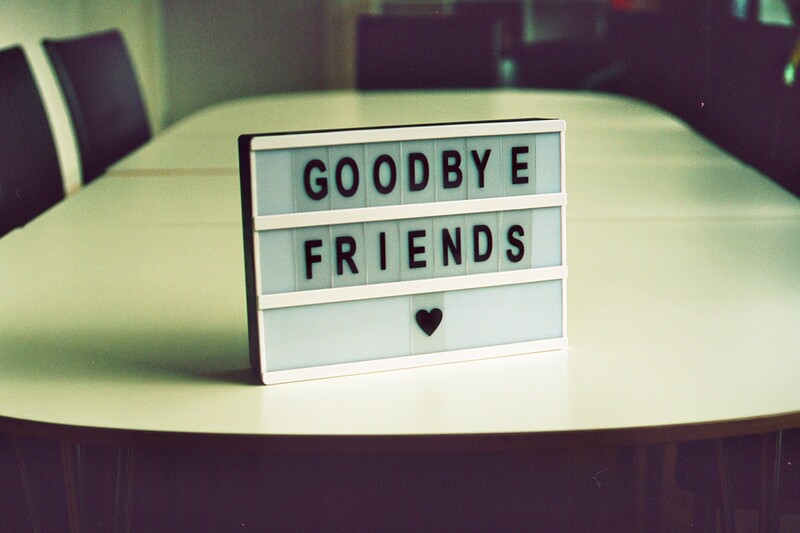 A silent goodbye is often just as hard as a huge confrontation that brings relations to an end. Probably one of the most cowardly ways to end a friendship is to get in another friend to do it for you. Never having a chance to hear directly from a friend about what it is that’s gone wrong is quite distressing. Enlisting other friends often means that your relationship with them also takes a dive. It shouldn’t be about taking sides, or fighting each other’s battles. The Substitute gives a strong sense of disrespect for the persons involved in the actual relationship. It belittles what contributions you each made, and potentially muddies the waters — it will be hard to take anything away with clarity from the situation. So. What do we do instead? Cicero had a lot to say on friendships, and while he definitely didn’t predict all the ways we realise relationships through emojis these days, one point he made definitely still rings true. He said that a friendship can only exist between good men (or, you know, people of any gender), and it means acting morally towards each other. It means trying to do right by each other. As the name suggests, the Fade Out is the gradual ending of contact. Either in person, by text, over social media, wherever. It can be hard if you’ve got regular meetings in place with this person (e.g. if you have a lot of mutual friends). But it is a gentle way to end a friendship, without trampling any feelings. However, I still feel this is the method to choose only if the person is the kind of person with whom you have tried to have discussions in the past and failed. If the person is a stone cold narcissist or a serial manipulator, there might be no value in trying to create a positive discussion about why your friendship is ending. Sometimes it can just be best to slowly let it go. The way we all do this is to stop replying to messages, to gradually stop reaching out, and to minimise meetings. After a time, it should become a thing of the past. However, sometimes some friends might notice you dropping out of their life and start to wonder. They might demand to know why you’re more elusive — this really depends on the strength of the friendship initially. If they are too wrapped up in themselves and that was part of the problem, they may never notice. But if you were their emotional support, they probably will. Setting up an opportunity to talk through what has happened with a friend is really a good way to know clearly where everyone stands. What did you find difficult? How did you feel? What did they intend? Has there been a misunderstanding? Or has some other moral line been crossed? It isn’t easy to confront these questions, but they can offer us closure and a possibility for reflection and growth. If you’re intending on having the Constructive Conversation, there are some steps I think we can all take to make this a more successful interaction. 1.Find a neutral place to meet and chat. This might mean neither of your homes. But equally, you might be uncomfortable in a busy public place. It really is a judgment call — pick somewhere you can talk freely and comfortably. 2. If they want to talk over text, resist. This is not a conversation to be had via a screen. You could potentially do a phone call if absolutely necessary, but a face to face is the ideal. 3. Have a goal in mind, and expect a conversation — not a delivery of a monologue about your feelings. While you will have to explain your feelings, it’s important to go in with an attitude of openness to a discussion. Knowing what you’d like from it all will help — was there a particular incident you felt was never discussed? Do you just want to talk over some patterns in the relationship? Or explore how you both feel about something? Know your intention. 4. Keep remembering to listen, as well as speak. 5. Be soft on the person, hard on the issue. This means avoiding saying things like “You are really unkind,” and rather, “You were not kind in this situation.” It might help to have a list of topics you want to address, and rephrase these into how they made you feel and in what scenario they came about, rather than merely attacking the person directly as the culprit. After all, blaming and attacking only leads to defensiveness and hurt feelings, and that’s not the intention here. The intention should be to actually constructively talk through what has gone wrong. 6. Check in and take a break if necessary. It can be useful to check in and make sure you’re understanding the other person correctly, and they are understanding you. Simple as, “Let me get this straight…” or “Just so I’m clear, are you saying that…” will go a long way. And don’t make it into a marathon if it is getting too draining — take a break and offer to resume the conversation later if need be. Or decide for yourself where the line needs to be — if you’ve been talking for a while with no real conclusions, that in itself might be a sign. When we’re upset, or angry, or sad, we can start to muddle up what we’re feeling and why we are feeling that way. Emotions can crowd in on each other. As a result, we might not be able to fully articulate — to ourselves or others — what it is what we feel about what has happened, or how we have come to the point of wanting to end a friendship. Are we upset, or is it another feeling? Why are we upset or unhappy? About what specifically? Without clarity, it can be hard if we do decide to confront our soon-to-be ex-friend about why the situation has reached that conclusion. If a friendship was good at times but difficult, it is be worth allocating some time to thinking through why this was and what changed. On the other hand, if someone has been demonstrating some of the uglier traits of human behaviour, it might not be worth giving that person another second of your time or energy. This is a tough call, but you have to take care of yourself in the end. Sometimes, there’s just no way to talk or rationalise, there’s little to reflect on or take away. Sometimes it’s best just to draw the line and conclude, “That was a bad time.” In which case, you’re probably Fading Out. But for your own sake, recognise where the responsibility lies for that. It can be easy to look back on a toxic friendship — particularly one in which there was a lot of manipulation of your feelings — and wonder if you had a hand in things going wrong. Thoughts like, “I let them manipulate me,” or “I mustn’t have been worth being nice to.” Those thoughts are not worth indulging, but hurtful things people say can be internalised that way. Manipulative people are very good at making you responsible for things you are not responsible for. Dissect those thought more strictly. See my article on responsibility for the pie-chart exercise, which is a fantastic way to get started with this. As with the Substitute, it can be okay to get some advice from a mutual friend, but don’t drag them into it. They aren’t there to act your relationship out for you. So unfortunately it is going to just be up to you. That doesn’t mean you can’t seek out help or support though, and perhaps issues you have had are shared by those around you. But make sure you don’t gang up on a person. Talk through things if you need to, but be sure to get stuck in yourself with what you feel you need to do. If ‘taking a break’ from the friendship is what you know would help you the most, it’s important to try and stick to your guns on seeing it through. After all, your friend might react to a conversation in a variety of ways — they may try and change the parameters of the relationship, manipulate you back into being their friend, they might feel confused and hurt, they might want more answers from you than you know how to give. But it’s okay to say, “I have to go now,” if it is getting too much and you do just have to cut things off somewhere. It’s worth remembering too that we all do bad things in our friendships — we all make mistakes. It’s a matter of making a call about whether or not the negative outweighs the positive, overall. In many cases, there might be a friendship worth salvaging. I am personally glad when I don’t lose a friend, and when we do manage to talk through things in a constructive way, the friendship has felt stronger and happier as a result. However, every situation is different. The aim is to do what’s right for you, to make sure your relationships feel healthy, supportive and positive.